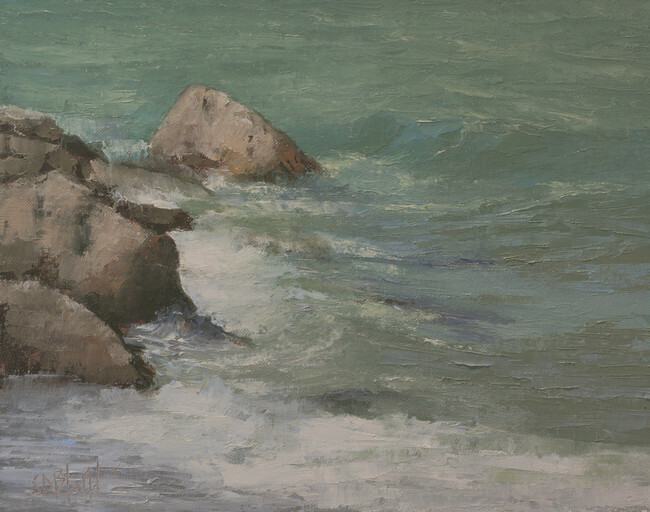 I love paintings of waves crashing against rocks, the swells and currents of the ocean against jagged cliffs. Unfortunately, there's none of that in Puget Sound: the beaches are stony, the sea is often dull gray, the waves are shadows of their ocean cousins. You must work hard to make something interesting. 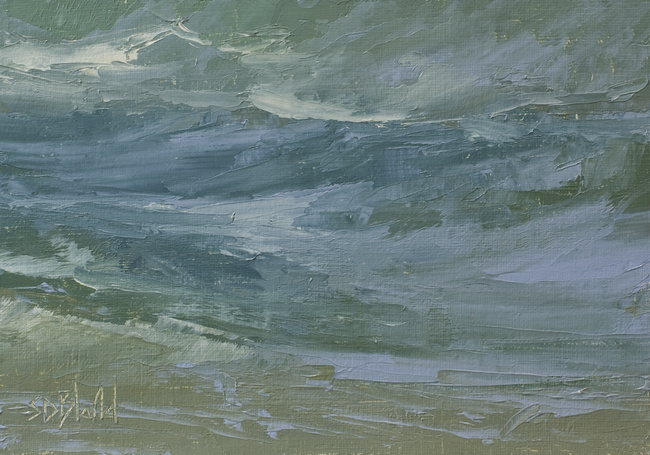 This blog post features some recent seascapes. I did the first three at the end of June 2018 after selling all the ones I had on display at my last art fair. The two smaller studies were done in early July 2018. 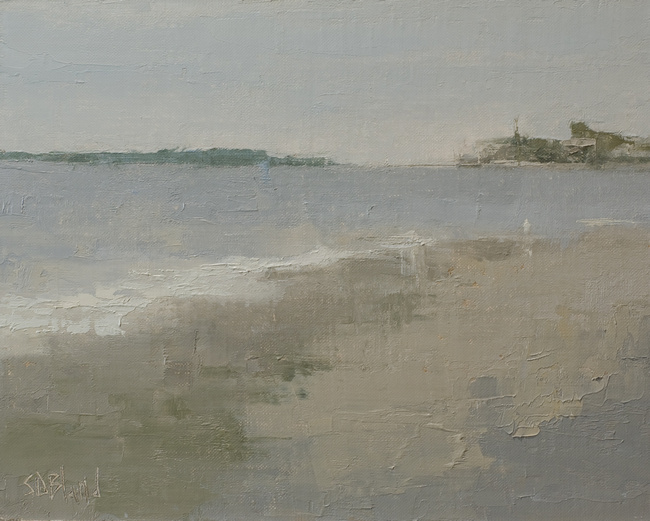 In these first two paintings I kept to an earthy gray palette: mostly ultramarine, burnt umber and yellow ochre. 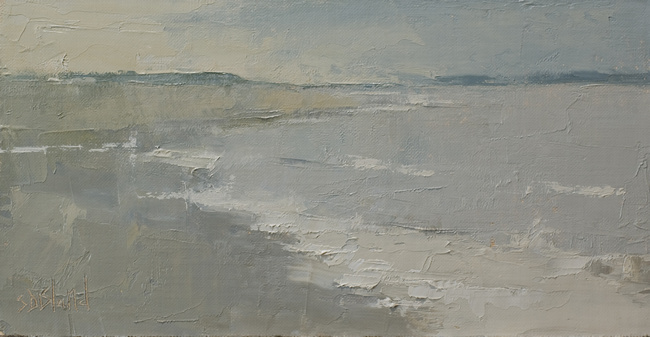 I tried to give this last seascape a feeling of elevation and eased up on the gray a little bit. Squint for best results. What all three of these paintings have in common is that I've taken an abstract approach—it makes for a more interesting picture when the subject is so uniform. The next two are small studies which I've done in preparation for some new work. I wanted to take a look at wave structures more closely and examine the way the colors change in the troughs and swells. The easiest approach was to cover the canvas in a layer of the dominant color (the green/gray in this case) then paint all the other shades into this wet-on-wet. I used a painting knife throughout. In this first study the paint application got away from me a little bit. The illusion of a water surface starts to break down when the edges between adjacent areas get ragged. Although I used the same technique of working wet-in-wet, I got a cleaner look with the second study. There was more room to work on this larger panel and I could use long, slow strokes of the painting knife. The thing with the surface of the ocean is that it's in constant motion, and the big lesson I learned here was that including every little detail killed the feeling of movement. I got the best results when I stuck with the big wave shapes and added a few highlights on top. 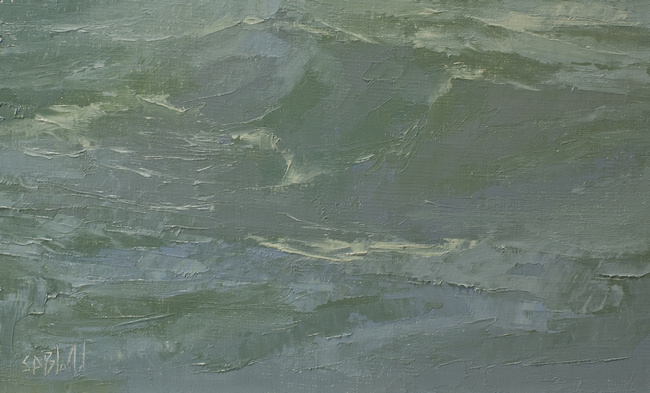 I used the studies in conjunction with the original reference photographs to work on this small painting. Note the use of faint outlining around the solitary rock and also around the wave shapes (albeit with a light value). It was hard to follow my own advice and keep out of the detail.